Any theology of Johnny Cash is going to spend time with the theme of solidarity expressed in his iconic song "The Man in Black." In the last post we focused on the solidarity Cash expressed for Native Americans in his album Bitter Tears. For other examples of that particular theme see also the openings of the albums Ride This Train and Sings the Ballads of the Old West. In this post we turn to look at how Johnny Cash expressed solidarity with those in prison. After switching from Sun Records to Columbia in 1958 Cash struggled to maintain the early success he had experienced with Sun. Columbia was starting to wonder if it should renew Cash's contract. In 1963 Cash found another hit single with "Ring of Fire" which temporarily buoyed his prospects with Columbia, but Cash was struggling to find a hit album with the Columbia label. Much of Cash's artistic struggles during this time were due to his deepening drug addiction. For years Cash had been doing concerts in prisons. And the reception he received from those audiences and the energy created in those venues made Cash interested in doing a live album recording of one of these concerts. But Cash couldn't get the record label or his producer to take a chance on such a project. But when Bob Johnson took over producing Cash's work for Columbia in 1967 Cash had finally found someone interested in the idea of recording a live prison concert. And so it was on January 13, 1968 that Cash and his band recorded a concert in the Folsom State Prison in California. The recording of the concert became the album At Folsom Prison. At Folsom Prison was a popular and critical success. The album threw Cash back into the national spotlight, revitalizing Cash's sagging career. Today At Folsom Prison is widely considered to be Cash's finest album. Listening to At Folsom Prison you are struck by Cash's ease and rapport with the men in the prison. And while he never served a prison sentence, some of this rapport was due to the fact that Cash had himself been in jail many times. 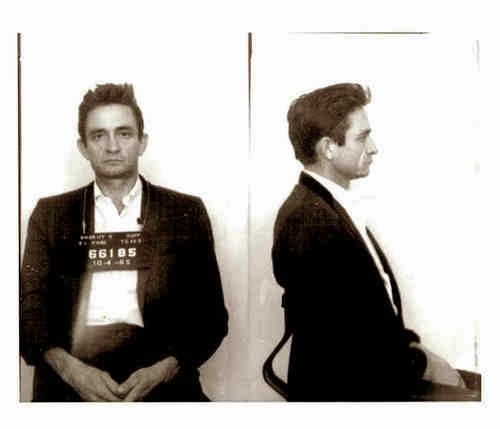 Cash's most publicized arrest occurred in 1965 when he was arrested by a narcotics squad in El Paso, TX. The picture of the handcuffed Johnny Cash, wearing dark sunglasses, made national headlines. His mug shot is pictured here. The culture of a thousand years is shattered with the clanging of the cell door behind you. Life outside, behind you immediately becomes unreal. You begin to not care that it exists. All you have with you in the cell is your bare animal instincts. I speak partly from experience. I have been behind bars a few times. Sometimes of my own volition sometimes involuntarily. Each time, I felt the same feeling of kinship with my fellow prisoners. Behind the bars, locked out from “society,” you’re being re-habilitated, corrected, re-briefed, re-educated on life itself, without you having the opportunity of really reliving it. You’re the object of a widely planned program combining isolation, punishment, taming, briefing, etc., designed to make you sorry for your mistakes, to re-enlighten you on what you should and shouldn’t do outside, so that when you’re released, if you ever are, you can come out clean, to a world that’s supposed to welcome you and forgive you. Can it work??? “Hell NO.” you say. How could this torment possibly do anybody any good…..But then, why else are you locked in? You sit on your cold, steel mattressless bunk and watch a cockroach crawl out from under the filthy commode, and you don’t kill it. You envy the roach as you watch it crawl out under the cell door. Down the cell block you hear a steel door open, then close. Like every other man that hears it, your first unconscious thought reaction is that it’s someone coming to let you out, but you know it isn’t. You count the steel bars on the door so many times that you hate yourself for it. Your big accomplishment for the day is a mathematical deduction. You are positive of this, and only this: There are nine vertical, and sixteen horizontal bars on your door. Down the hall another door opens and closes, then a guard walks by without looking at you, and on out another door. You’d like to say that you are waiting for something, but nothing ever happens. There is nothing to look forward to. You make friends in the prison. You become one in a “clique,” whose purpose is nothing. Nobody is richer or poorer than the other. The only way wealth is measured is by the amount of tobacco a man has, or “Duffy’s Hay” as tobacco is called. All of you have had the same things snuffed out of your lives. Every thing it seems that makes a man a man. A woman, money, a family, a job, the open road, the city, the country, ambition, power, success, failure – a million things. Outside your cellblock is a wall. Outside that wall is another wall. It’s twenty feet high, and its granite blocks go down another eight feet in the ground. You know you’re here to stay, and for some reason you’d like to stay alive--and not rot. So for the fourth time I have done so in California, I brought my show to Folsom. Prisoners are the greatest audience that an entertainer can perform for. We bring them a ray of sunshine in their dungeon and they’re not ashamed to respond, and show their appreciation. And after six years of talking I finally found the man who would listen at Columbia Records. Bob Johnston believed me when I told him that a prison would be the place to record an album live. Here’s the proof. Listen closely to this album and you hear in the background the clanging of the doors, the shrill of the whistle, the shout of the men…even laughter from men who had forgotten how to laugh. But mostly you’ll feel the electricity, and hear the single pulsation of two thousand heartbeats in men who have had their hearts torn out, as well as their minds, their nervous systems, and their souls. Hear the sounds of the men, the convicts all brothers of mine with the Folsom Prison Blues. 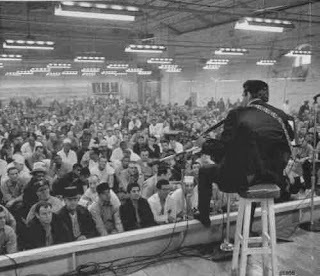 In the afterglow of the success of At Folsom Prison Cash followed up in 1969 with a second live prison concert album At San Quentin. At San Quentin was also a success and is mainly known for its breakout single "A Boy Named Sue." But in keeping with our focus on the theme of solidarity I'd like to draw your attention to the song "San Quentin" from the album. If you look at the track listing of At San Quentin you'll note that the song "San Quentin" appears twice. And the reason this song appears twice is a wonderful example of Cash's ability to speak for the men in prison, to give voice to their sorrow, anger and hopelessness. San Quentin, you've been livin' hell to me. You've hosted me since nineteen sixty three. I've seen 'em come and go and I've seen them die. And long ago I stopped askin' why. Mister Congressman why can't you understand? The prisoners of San Quentin went wild. So wild they demanded Cash sing the song again. Immediately. So Cash does. And that's why the song "San Quentin" appears twice, back to back, on the album. Cash had, once again, found a way to speak for those on the margins. He had found the words that expressed the lament of the inmates of San Quentin. When you listen to the album you can hear the men cheer and cheer. I'm not insistent on the point. 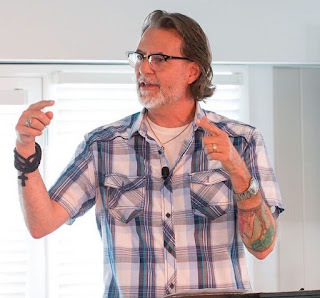 I think if you consult the best of the Christian intellectual tradition--rather than evangelical culture--you find that Christian theologians don't restrict God's revelation "the Bible." Interestingly, I think the Bible makes that exact point. The Bible points beyond itself. Indeed; "for he who has the ears to hear"-- right? Russian Communism, a flute concerto, a blossoming shrub, or a dead dog. Yes, that God uniquely reveals himself - not in the Bible as such, but in Jesus to whom the Bible witnesses - does not mean that God reveals himself solely in Jesus. Or as Barth will later put it, there is the one Light of the World, yes, but there are also "lesser lights" that, like "cats' eyes" reflect, the Greater Light and reveal God's truth. Christ is the criterion of their truth, not their exclusion. More germanely to JC (the Johnny Cash JC! 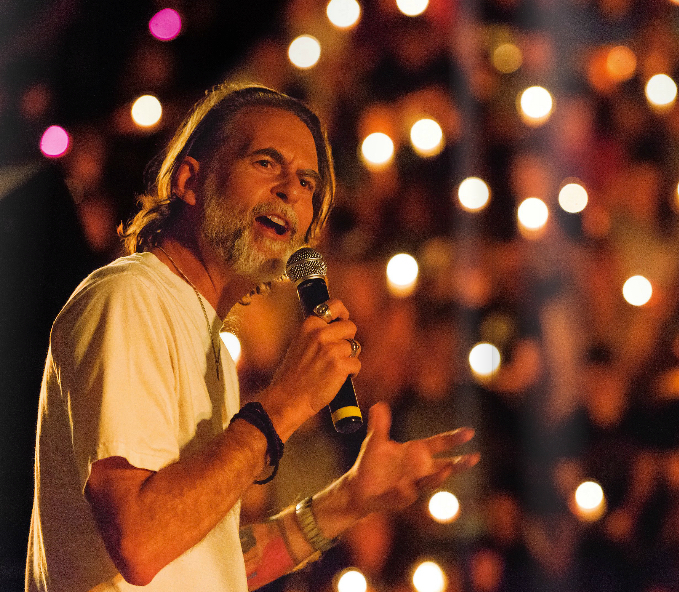 ), Folsom, and San Quentin - Matthew 25:36a: according to Jesus himself, God reveals himself, speaks to us, in prison, indeed in prisoners, little lights in grim darkness (and, note well, the question of innocence and guilt is not raised - nor are prison governors/wardens mentioned!). Some scholars have spoken of Matthew 25:31ff. in terms of "anonymous Christianity". No! The passage speaks of the "anonymous Christ" - God revealing himself in the "least of these" as Christ, as sure as in the gospel or the sacrament. Yes, that God uniquely reveals himself - not in the Bible as such, but in Jesus to whom the Bible witnesses - does not mean that God reveals himself solely in Jesus. Or as Barth will later put it, there is the one Light of the World, yes, but there are also "lesser lights" that, like "cats' eyes" reflect the Greater Light and reveal God's truth. Christ is the criterion of their truth, not their exclusion. Maybe you could write a theology piece about his humor, too. Sadly, I didn't have that in the series. Do you know Cash recorded a whole album of joke songs? It's Everyone Loves a Nut. No, I hadn't. Sounds great... I'll have to check it out. That is good, Kim. Thank you.